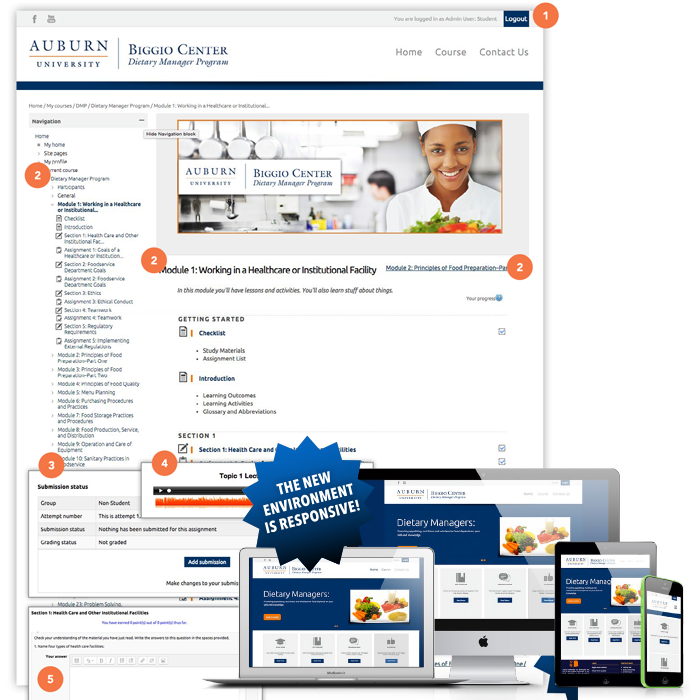 Auburn University’s Dietary Manager Program needed to be converted from a paper-based, correspondence, certificate program to a fully online, self-paced certificate program. It existed as a self-paced, correspondence certificate program. DMP Mails Brochure / Registration form. Student Mails Check & Registration form. DMP Mails Program Materials to Student. Materials consist of printed documents in a three ring binder and audio CDs. DMP Mails Program Materials to Clinical Instructor. Materials consist of printed documents in a three ring binder and audio CDs. Clinical Instructor reviews assignment and submits back to student. Student mails assignment to Dietary Manager Program and proceeds to next lesson. DMP mails graded assignment back to student. spread out over several years. Now it is fully online. It exists as a self-paced, online certificate program. Students self-register and pay. Clinical Instructors self-register. Student takes course. Content is broken into easy to manage chunks. Clear indicators focus on what is expected, what is coming up, and how to proceed in this self-paced, guided program. Automated processes for ease of use that can be applied across custom learning designs. Student and Clinical Instructor work together within the system. Student uploads final assignment and notifies grader. Student can then move to the next lesson. FTA created a custom workflow based on groups. 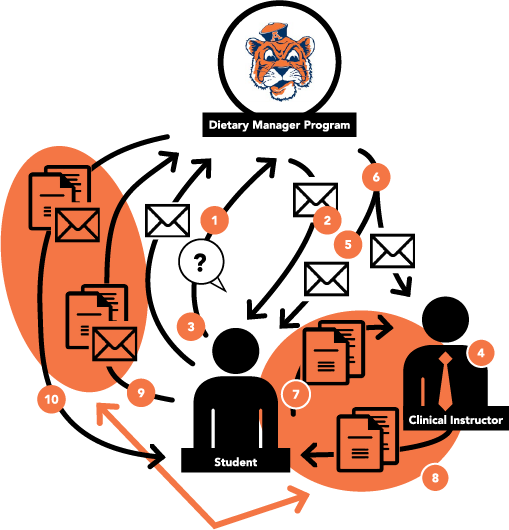 The workflow allows students and clinical instructors to collaborate on activities within the system before submitting to graders. Audio files are embeded and play within the system. Having audio files play within the system allows for just-in-time learning and reduces the pieces of equipment needed to take the course. Knowledge checks are built into lessons to ensure student engagement and understanding. Full Tilt Ahead is most energized by the process of working collaboratively towards specific goals. We thrive on problem-solving and creative design challenges and will work closely with you to imagine and re-imagine effective and innovative approaches.We’re looking for a new dream to build and would love to hear about what you’re working on. Let’s have a conversation!